Ryan Lochte, the second most decorated male Olympic swimmer of all time, has been banned 14 months for receiving an intravenous infusion without a therapeutic use exemption, a violation which he unwittingly self-reported on social media, the US Anti-Doping Agency (Usada) announced on Monday. 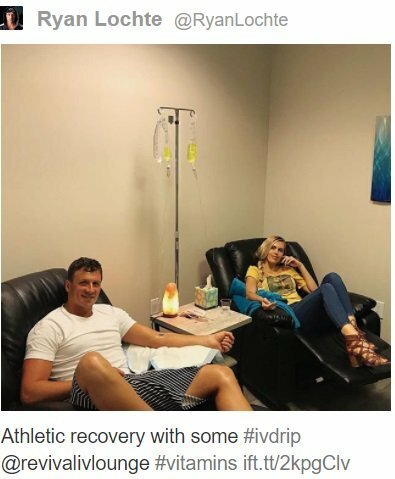 Usada said it became aware of the potential infraction when the 33-year-old American star posted a since-deleted photo of himself receiving the injection on Instagram with the hashtag #ivdrip, adding that Lochte “fully cooperated” with the ensuing investigation. US officials further clarified that Lochte, who has brought home 12 medals from the past four Olympics including six golds, was not using a banned substance, but that doping rules prohibit athletes from receiving IV infusions or injections unless “legitimately received in the course of hospital treatment, surgical procedures, or clinical diagnostic investigations”. “This is devastating for my family and me,” Lochte said at a news conference in Florida later Monday. Lochte said he took the IV containing B12 and other vitamins available over the counter because his wife and son had been sick and he sought a preventative boost for his immune system. Usada said the ban is retroactive to 24 May, which was the day he posted the photo, and will run through June 2019, ruling him out of the next two major international meets: August’s Pan Pacific Championships and the 2019 World Championships in Gwangju, South Korea. The punishment would appear to cast doubt on his stated goal of making the US team for the 2020 Olympics in Tokyo, during which Lochte will turn 36. Lochte will also be withdrawn from the four events he’d entered at the US national championships, which begin Wednesday in Irvine, California. Ryan Lochte addressed the media on Monday afternoon at a news conference following the announcement of his 14-month suspension. “I’ve been swimming my whole life and I’ve been monitored by Usada for my entire competitive career,” he said. “I have never taken a prohibited substance. I have never attempted to gain any advantage over my competition by putting anything illegal in my body. I would never do that. This is very serious to me. I would never intentionally violate any anti-doping rule. USA Swimming and Lochte’s agent did not immediately respond to separate requests for comment from the Guardian. The sanction marks the second extended suspension in two years for Lochte, who previously served a 10-month ban and was made to forfeit $100,000 in bonus money that went with his gold medal at the 2016 Olympics for his role in vandalizing a gas station in Brazil with three other US swimmers during a drunken night out at the Rio Games following the completion of the swimming programme. The embarrassing fallout stemming from Lochte’s attempted cover-up story of a ‘robbery’ came to overshadow the final week of the Olympics and cost him four sponsorships, including deals with Speedo and Ralph Lauren. Additionally, Lochte faced charges of falsely communicating a crime to authorities, but an appellate court in Brazil ultimately dismissed the criminal case nearly 11 months after the incident took place. Lochte becomes the second American swimmer to be hit with a lengthy ban during the run-up to US nationals after former University of Texas star Madisyn Cox, an individual medley specialist who captured a gold and a bronze medal at last year’s world championships, was suspended for two years last week after testing positive for the banned stimulant trimetazidine by Fina, the sport’s world governing body. Moscow authorities have banned "Velonoch"